We’ve compiled a list of 42 DIY couch sofa plans. Scroll through our list and click the ‘View The Plans’ button to check out the instructions. There are a variety of different couch styles you can build- armless wood pallet sofas, casual outdoor loungers, guest bed sectional couches, plywood patio outdoor furniture and fold out couch bed hacks. 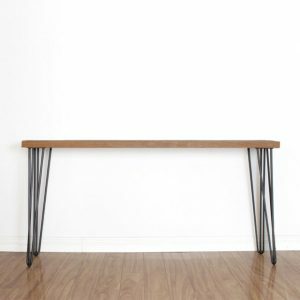 Whether you’re an amateur looking to save money on a pricey couch from West Elm, or an experienced carpenter looking to supplement your living room furniture, there are some interesting DIY options you can choose. Some builders combine aspects of different project plans together with visual inspiration from places like Pinterest. Get creative- but remember to measure twice and cut once! Buying furniture for your home is often an expensive experience. But if you are wondering how to get cheap furniture, you’ve found the right place. 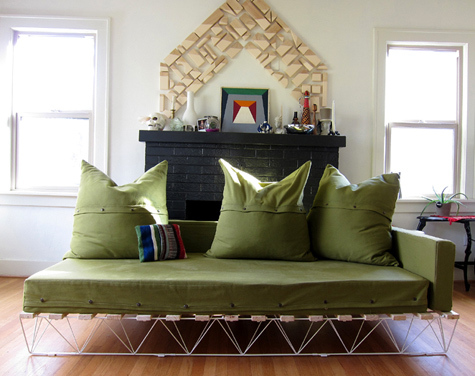 This design will help you build a sofa set out of old pallets, and therefore it will cost you next to nothing. What’s more, you can move this couch set wherever you want with minimal effort. The builder uses whole pallets for the L-shape sofa and the coffee table and left-over pallets slats for the ottomans. For extra mobility, you can install caster wheels on the sectional couch, the coffee table and the stools. 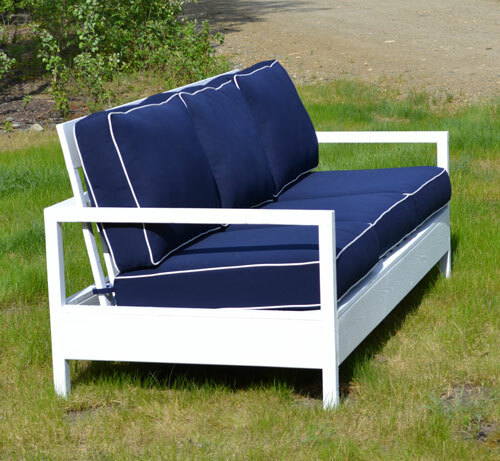 An outside sofa is perfect if you want to spend an afternoon in the sun and enjoy a drink with your friends. And although this homemade sofa is made out of pallets, it looks so amazing that you can hardly tell that it’s an amateur project. What’s more, it’s going to last you for years and add character to your patio. For durability, the builder recommends that you seal it with polyurethane and apply a brown finish. Cheap couches might be hard to find on the market, but why don’t you take matters into your own hands and build yourself an amazing DIY sofa? All you need are three old doors, pieces of scrap wood (2 x 4s) and screws. And you’ll have your living room couch ready in no time. The builder recommends that you paint it an off-white color. If you want to keep the aged look, don’t paint it 100 %. 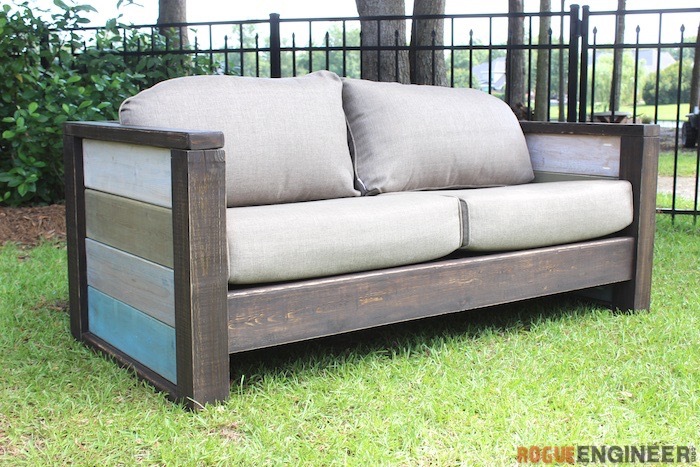 If you’re searching for inexpensive furniture, you have to see this re-purposed wood couch. It looks so fantastic that it might be hard to believe that it doesn’t come from the sofa furniture shop. 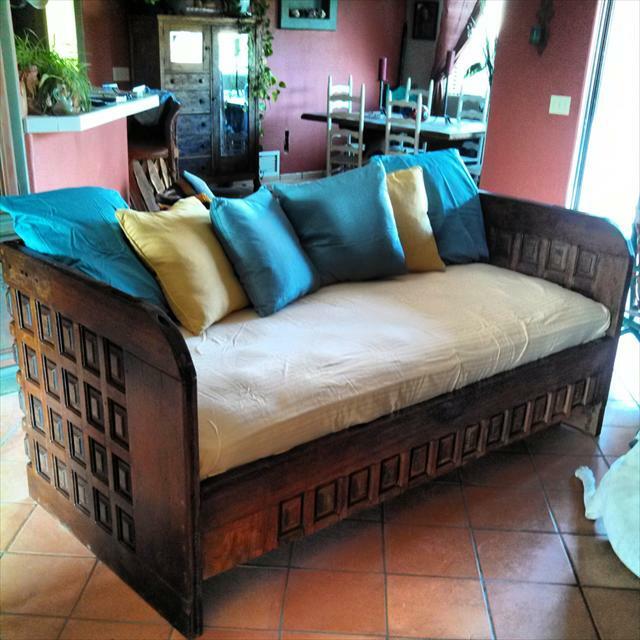 This sofa bed is made of old doors, and you can customize it to fit your available living space. It will certainly change the look of your living room for the better, but the instructions are on the thin sides. You might want to get someone to help you if you are a DIY novice. What’s so great about this modern sofa is that you don’t have to do much cutting because there are no arms or back. You’ll need screws, nuts, and bolts to assemble the pallet pieces and a screw gun. 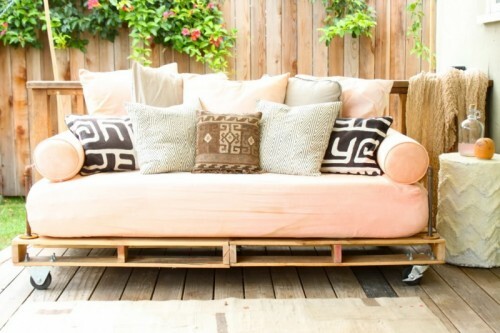 To complete the pictures, you can make a pallet coffee table to match the sofa. If you want to move your couch set around, you can insert industrial castor wheels. However, be very careful if you’re dismantling the pallets by yourself and look out for hidden bolts or nails. 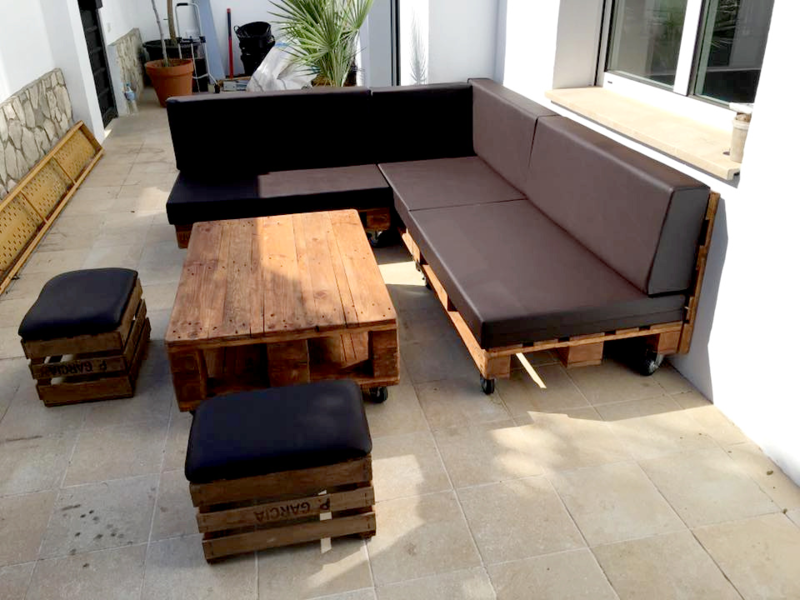 There is a reason why pallet furniture is so popular – it’s easy to make, it’s cheap and suitable both for inside/outside. If you are ready to give it a go, this plan for a large sofa is just for you. What’s so great about it is that you can personalize with pillows and fabrics however you want and give it an expensive look. It’s also very big if you haven’t noticed, so you’ll have room for all your friends when they come for a visit. And there is a step-by-step titular for your convenience. These amazing loveseats look so comfortable that you can hardly resist their charms. You might find it hard to believe, but they are made out of pallets and wood. Nothing special, nothing you can’t find at a lumber yard. And everything will cost you no more than $50 because you need only three sheets of plywood to cover the pallets and some soft cushions as a final touch. Moreover, these comfy couches will add style and character to any room. 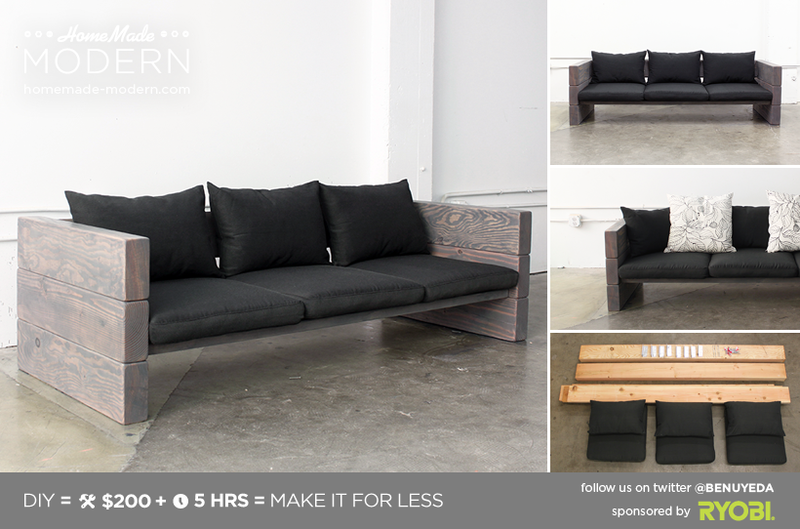 Enter your text here…When your old couch gets too worn and old, you don’t have to buy a new sofa. Instead, you can try this plan, which will show you how to reupholster an old sofa and turn it into a fantastic gray couch that looks brand new. What you need is a plain painter’s drop cloth, which you can find at Home Depot, staple gun, nose pliers, flat head screwdriver, and upholsters threads and needles. The builder has included very detailed instructions, so even those of you who had never reupholstered a sofa will have to issues. 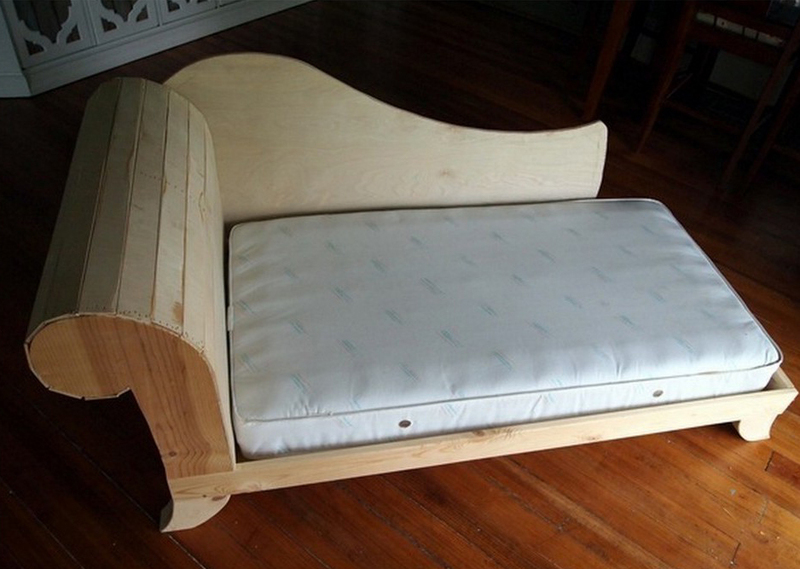 If you are looking for an easy sofa bed, you must see this simple design. It will help you build a couch around whatever sofa cushions you have or a sofa mattress (in case you want to use it as a day bed). What’s fantastic about this plan is that there is a list of all the necessary materials, detailed step-by-step instructions, diagrams, and a video to show you how it’s done. You can use TK to keep the natural look of the wood. A stylish black couch for your living room might cost a fortune on the market, but don’t despair. You can build one very easy if you follow these step-by-step instructions. 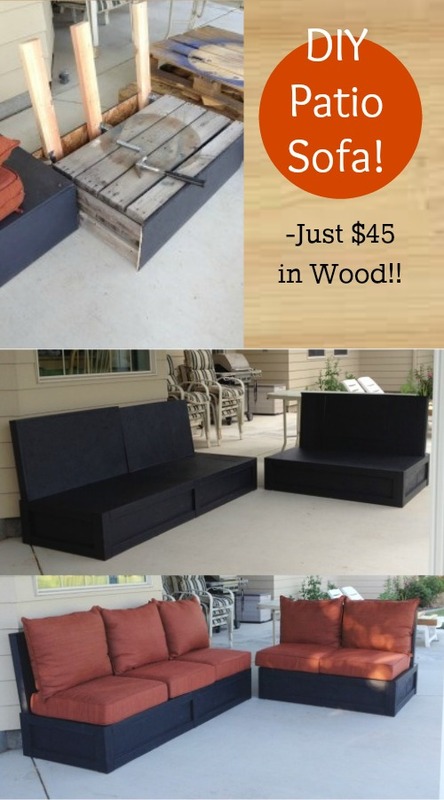 You just need solid wood (2 x 8s and 4 x 8s), IKEA sofa cushions, and Minwax wood stain finish (gray). Of course, you’ll also need some power tools like a circular saw, cordless drill, and miter saw with laser. In case you don’t know how to use these tools, get help. 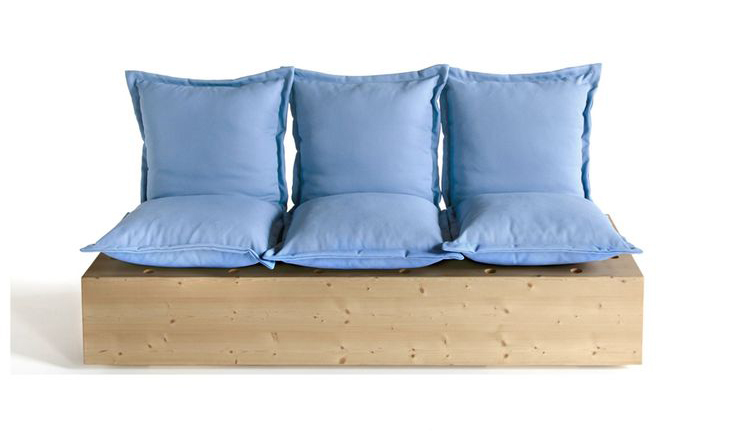 You just have to take a look at this comfy sofa bed to fall in love with its design. The great thing is that you can remove the top seat and turn the couch into a queen size bed. The couch measures 33 x 72 x 32 inches, while the bed’s dimensions are 54 x 72 inches. There is a list of the necessary materials and a cut to list to make things easier for a novice. There are also some tips how to stitch and sew the pillows. And everything will cost you no more than $200. Are you up to building something extraordinary? Then you can use this plan and make your children mini fainting couches. I know that it sounds crazy, but the moment you see the design, you’ll fall in love with it. And the excellent thing is that you can use your existing crib mattresses and build the bedroom couches around them. 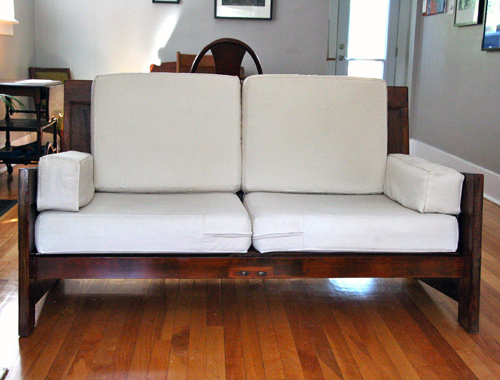 To finish the project, you’ll need a Kreg jig, and a band saw to cut the couch’s arms. Also, you don’t have to worry about your children falling because this white couch bed is not that high. Are you up to building something extraordinary? Then you can use this plan and make your children mini fainting couches. I know that it sounds crazy, but the moment you see the design, you’ll fall in love with it. And the excellent thing is that you can use your existing crib mattresses and build the bedroom couches around them. 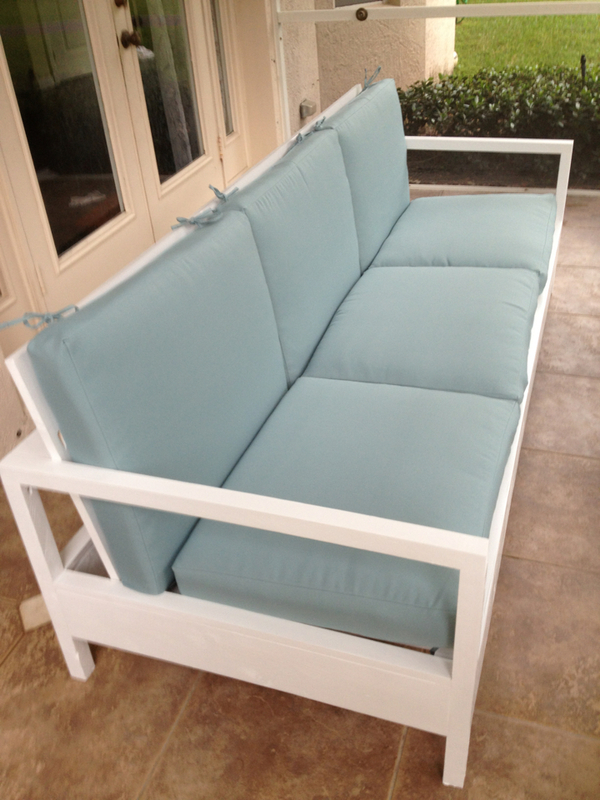 To finish the project, you’ll need a Kreg jig, and a band saw to cut the couch’s arms. Also, you don’t have to worry about your children falling because this white couch bed is not that high. What’s so great about this beautiful sofa is that it’s perfect for daytime napping and when the need arises you can turn it into two separate bedroom couches. You just need a double pallet – 240 cm x 80 cm and a 180 cm x 80 cm one. For convenience, you can add wheels to the bottom bunk so you can roll it out. The builder provides you with a full list of the required tools and materials, and there are step-by-step instructions and pictures to help you along. You can use IKEA’s Florvag Mattress if you stick to the provided dimensions and add your own finishing touches. You don’t have to buy an expensive couch to add style to your living room. Just take a look at this fantastic DIY black lounge sofa, and you’ll know I’m right. 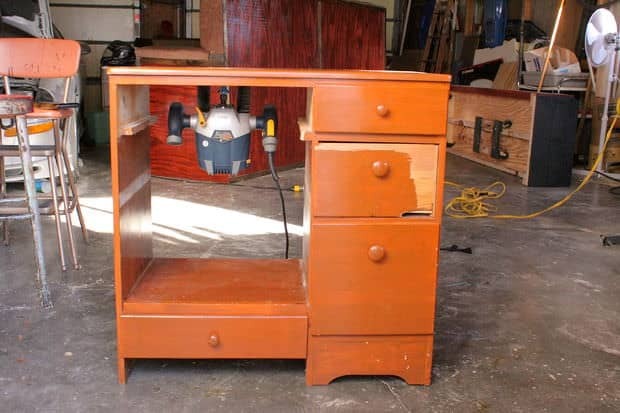 To build this beauty, you need a simple wooden frame, two cheap mattresses, eight legs from an IKEA bed, a staple gun, furniture fabrics, and lots of pillows for the back. The instructions are on the thin side, but this is not a complicated project even for a novice woodworker. If you are wondering how to make a stunning outdoor sofa that will turn your friends green with envy, you shouldn’t miss this impressive design. 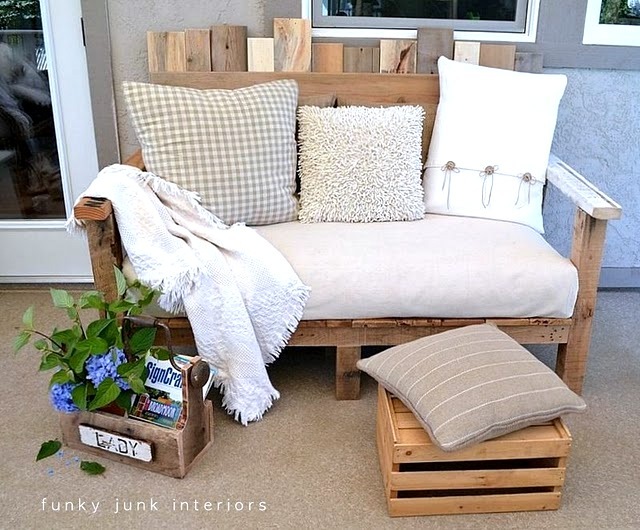 You just need an old bench, a 3″ foam cushion, batting, thread, fabric, sew-in Velcro straps, and some tools, including an electric carving knife for cutting the foam. The builder recommends that you use shower curtains as fabric because they are durable and won’t get damaged easily. And the excellent thing is that there are well-written instructions to guide you through the whole project. If you have avoided building a sofa bed because you think it’s too complicated for you, this plan will change your mind. 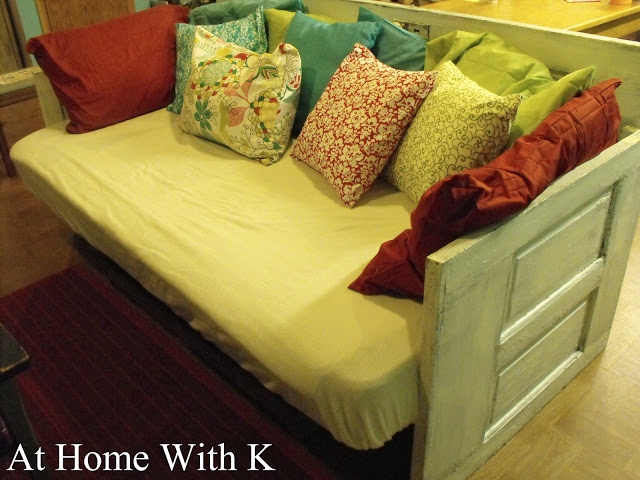 It will help you turn an Ikea bed frame into a comfortable living room couch. You’ll also need a firm mattress, fabric, foam, foam glue, a staple gun, and a wood saw. The builder advises that you choose a foam at least a few inch thick so that you can lean on it comfortably. This contemporary sofa will be the centerpiece of your room, and only a few will be able to guess that it’s made out of pallets. What’s more, this sectional couch has another hidden feature that will blow your mind. I’m talking about secret storage compartments beneath the berth seats. 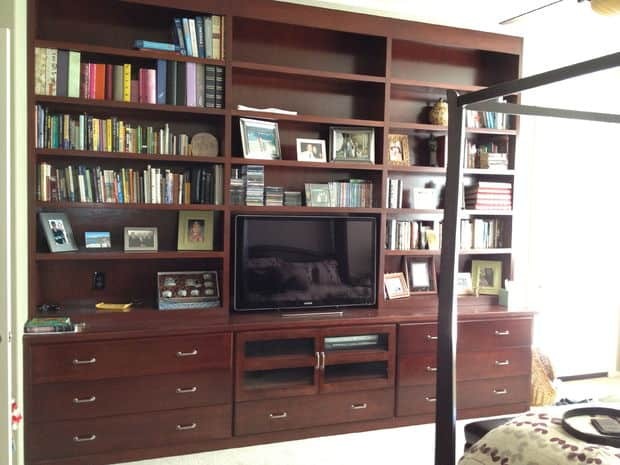 There is plenty of space for storing odds and ends and keeping your living room tidy and spotless. You can also build a matching coffee table to complete the set. This titular will show you make a contemporary sectional sofa for your living room with ease. For the design to work, you have to choose carefully the pallets you’re going to use. Look for sturdy ones that you can stack for the couch frame. Then pick up some fabric you like and soften the edges with fabric stripes. 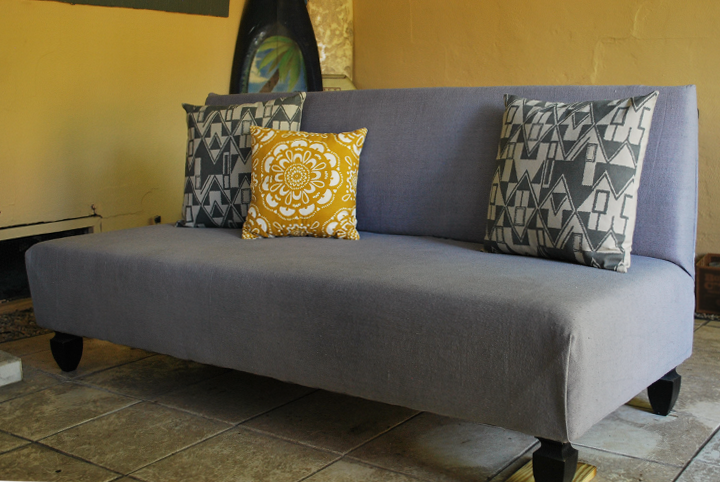 You’ll need a nail gun and scissors to finish upholstering your new sofa and voila! If you are feeling up to one more project, you can turn a single pallet into a matching coffee table. 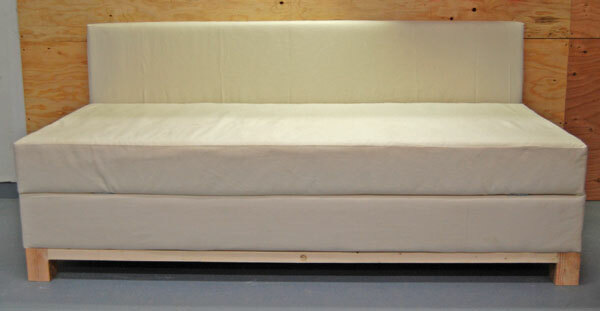 For just $120 you can build a stylish white couch for your house that can function as a sofa bed as well. You just need a foam camping pad measuring 30″ x 72″ x 3-1/2″, paint drop cloth fabrics, 2 x 4s, 2 x 6s, 2 x 10s, 1/4″ plywood, and you’re ready to begin. What’s also great about this couch design is that there is a built-in storage place for beddings. Just have to lift the seating. If you want to make the heavy-lifting easier, you can add straps. This free couch plan will help you build a fantastic outdoor modern sofa with deep cushions for your patio. You’ll need a Kreg jig, 2 1/2″ and 1 1/2″ pocket hole screws to make the frame. The builder offers you two choices regarding the pillows – you can buy them from Ikea, or you make custom sized cushions. The back cushion measures 24″ x 18″ x 6″, while the seat one – 24″ x 26 1/2″ x 6″, but you can change the dimension to suit your needs and the frame you make. If your living room sofa is looking worm, it’s time for a change. You can use this amazing plan based on Ana White’s Weatherly sofa and make yourself a couch that will leave your friends speechless. You can tweak the design and change the dimensions to suit your needs and the lumber you have. Here, the builder uses ebony gloss paint finish and pine as the main building material. An outdoor lounge sofa is a perfect place for relaxation in a cool autumn day. 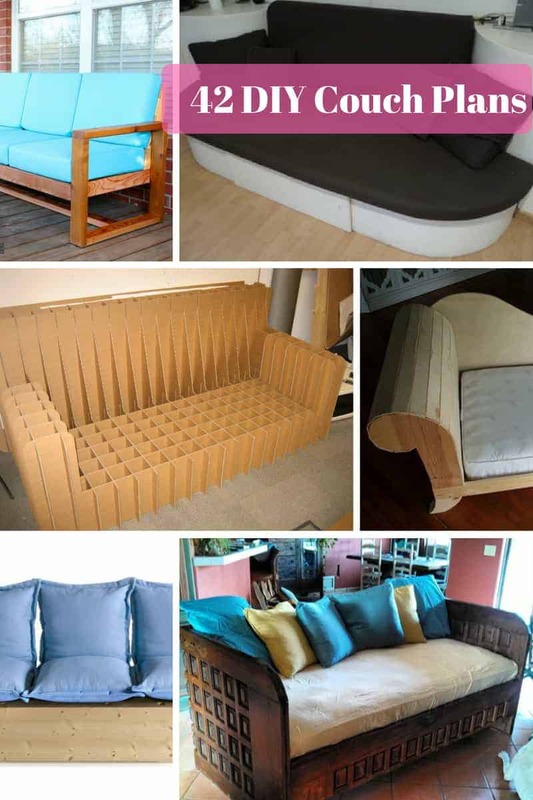 And thanks to these plans, you can make yourself a cheap couch in a couple of hours. The design is a based on Ana White’s outdoor white couch plan, but the builder uses 22″ x 22″ cushions instead of 24″ x 24″ ones and makes the sofa slightly smaller. There are no cushions at the back to give you more room to lean on, but you can add some if you are uncomfortable. 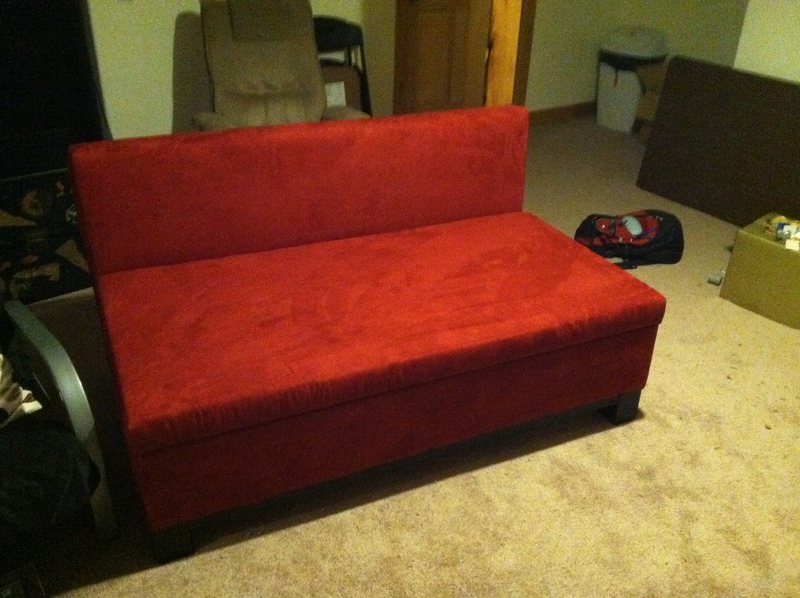 For those of you that have been dreaming about an awesome red couch, I have just the thing. This red sofa is a modification of Ana White’s storage couch plan, but the builder makes it slightly shorter – 60″ in length instead of 72″. 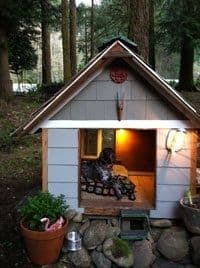 He uses lumber and OSB boards for the construction. However, this is a project that requires some skills and abilities in woodworking, so it’s not very suitable for a novice builder. The good thing is that you’ll have a beautiful living room couch and a spot for keeping bedding and pillows out of the way. This colorful sofa could be a nice choice if you want to create a beach atmosphere in your home. And just like the previous model, this one also has a storage spot beneath the seats. 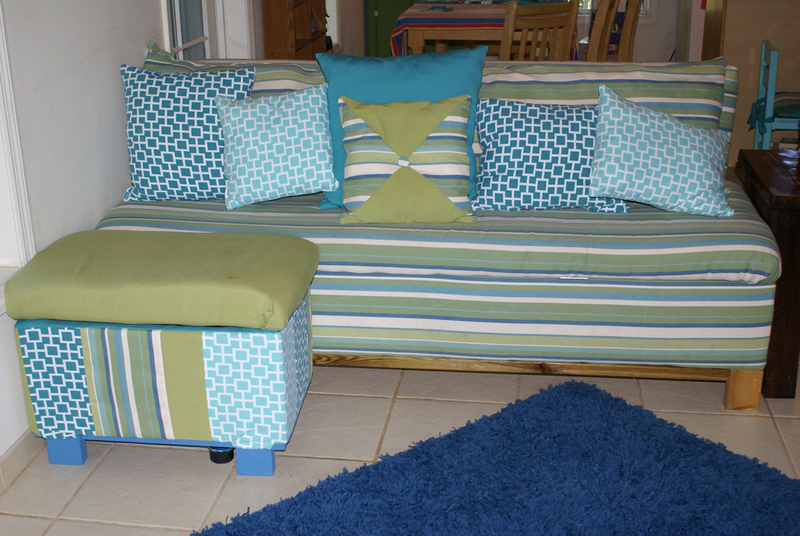 As a bonus, you can build an ottoman from the scraps to match the couch. But that’s not all. The ottoman is also a toy chest in disguise, and you can use it to store your children’s toys away. The builder uses pine for the construction and a clear poly finish on the visible parts. If you need a large sofa to stretch comfortably after a long day, this design is just the thing you need. 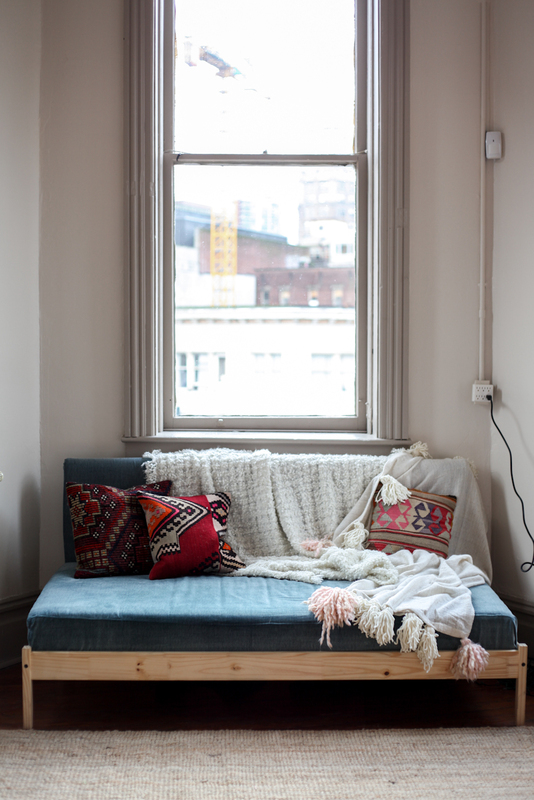 It’s based on Ana White’s storage couch plan, but the builder extends the length of the sofa bed up to 84″ and uses 5″ thick high-density foam. He recommends that you use 1/2″ plywood for the seat because 1/4″ is too flexible and 2 x 8 for the box. You can also design the seat with a zipping cover so that you can remove it and wash it. Are you looking for affordable patio furniture? 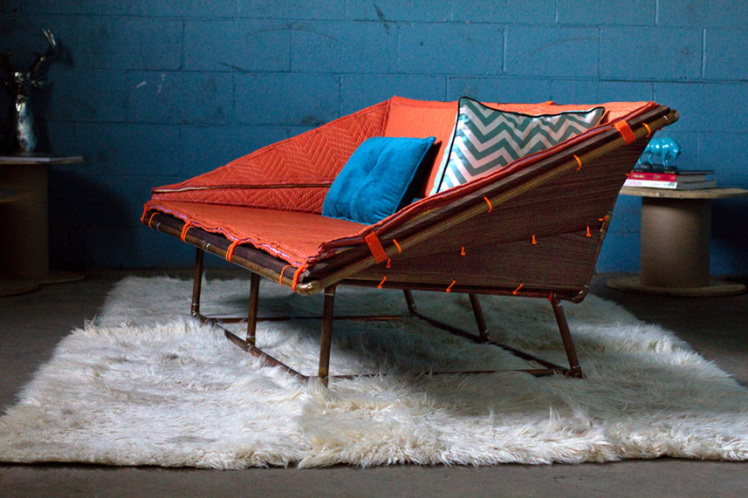 Then you’ve found a fantastic design that will help you build a long couch, perfect for an afternoon nap. 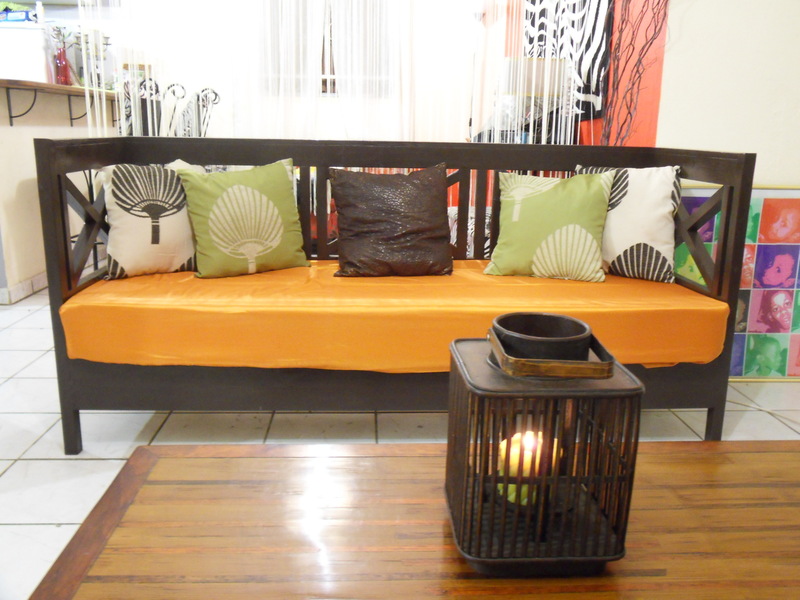 What’s more, you can modify the plan to suit the cushions you have if you don’t want to buy new ones. The builder recommends that you get a compound miter saw, a Kreg jig, and square head screws, so it’s for the best if you have some woodworking experience. Do you want something modern and stylish for your outdoor patio? 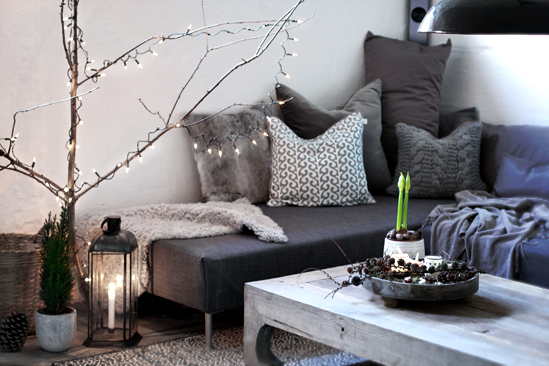 Then this gray sofa is just for you. You need treated lumber, a paint drop cloth, and some screws. 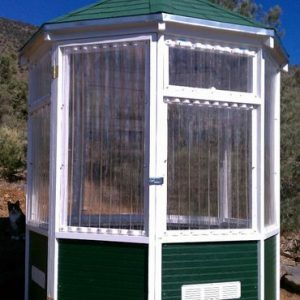 However, keep in mind that this is not a very cheap project, and it will cost you up to $350 depending on what materials you have on hand. 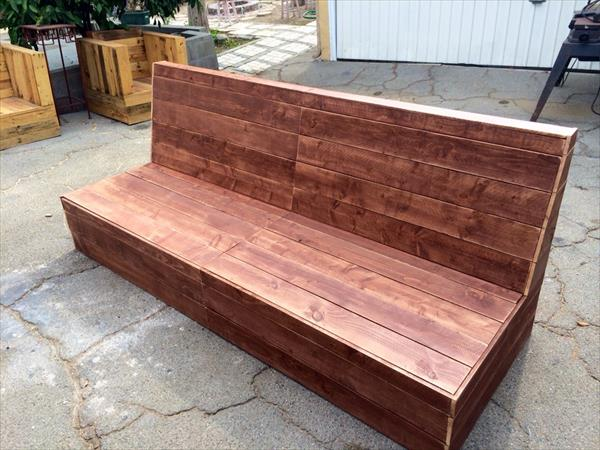 But the good news is that if you have experience in woodworking you can build this couch in a day. 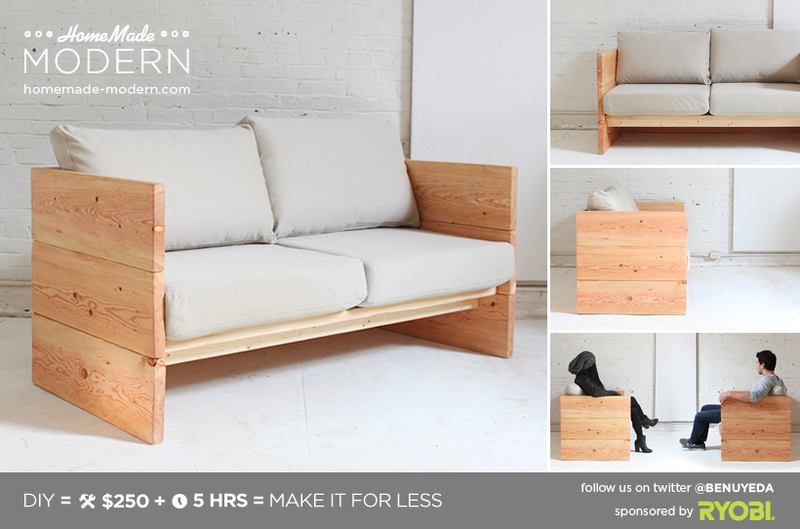 A modern sofa bed that you can build with minimal woodworking knowledge is not so impossible as you might think. Just look at this free couch plan. You need 2 x 4s and some power tools. For your convenience, you can download the step-by-step instructions. Moreover, there is a cut to list to help you and a video. 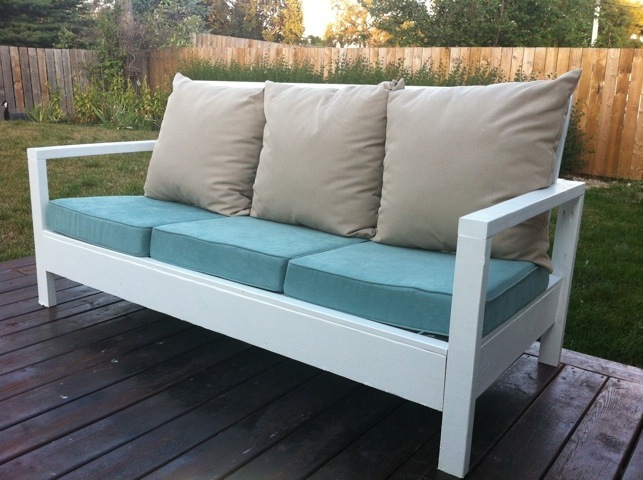 You can use 24” x 24” cushions for this solid wood outdoor sofa. A convertible bed might come in handy in multiple situations, and this plan will help you build a sofa with a matching convertible ottoman for the times when you need extra space. The builder recommends duck cloth fabrics because it’s water-resistant and easy to clean. However, this is a more expensive project, but it’s worth your efforts if you want something special for your home. 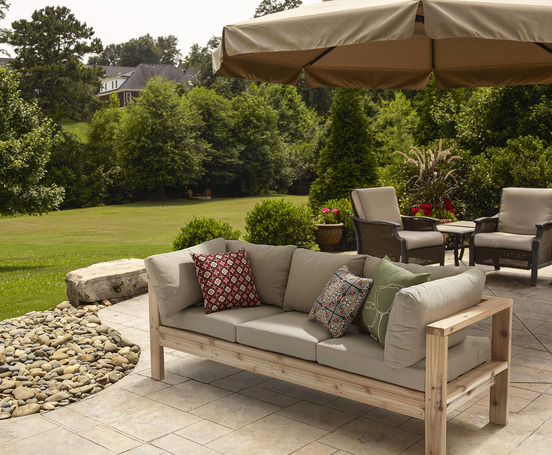 A sectional outdoor sofa might transform your old patio and serve as a spot for rest in the afternoon. 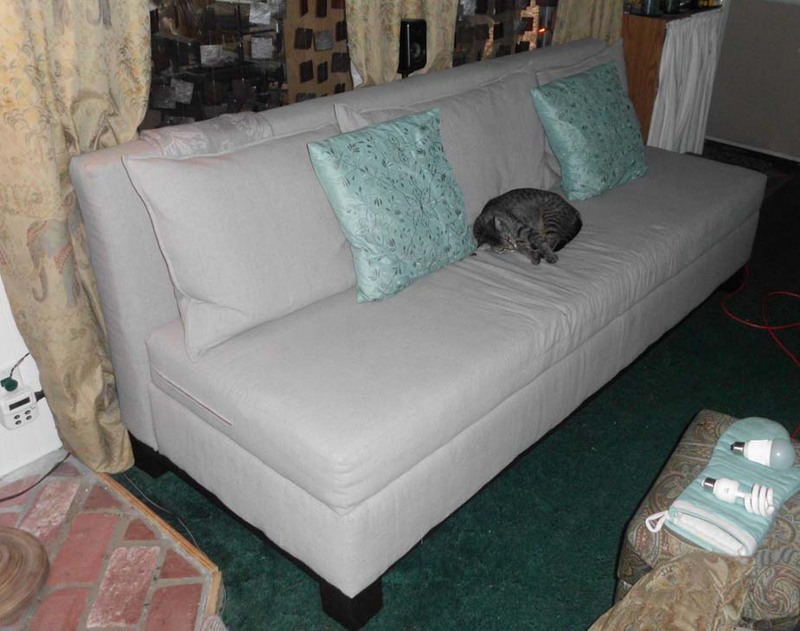 What’s great about this sectional couch is that it’s easy to build thanks to the video with step-by-step instructions. In addition to this, you can add a one-arm sectional piece if you want a large couch set. 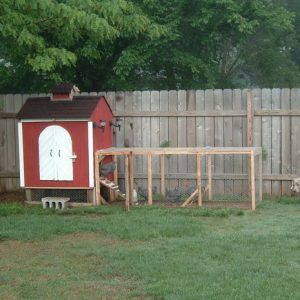 The builder uses cedar, but you can use recycled 2 x 4s if you have some left from other projects. And it’s also a good idea to apply exterior finish to protect the wood. For those of you that are looking for a unique couch design, this garden sectional sofa might just be the thing. However, there are no detailed instructions on how to build this couch, so you’ll have to improvise. If you are looking for some contemporary living room furniture ideas, then this design might appeal to you. It’s a one-arm green sofa with pillows and bolsters. You just need an Ikea bed frame, three 70″ x 30″ pieces of foam, upholstery-weight fabrics, and some sewing items. But don’t worry. The sewing part is not that difficult, and you need just the basics. There is something about old doors that makes them perfect for building furniture. If you think the same, then you can use this design and fashion a fantastic couch out of a set of old doors and white cushions. The longest and most challenging part of the project is stripping the doors, so be prepared to spend at least 30 hours on this step. 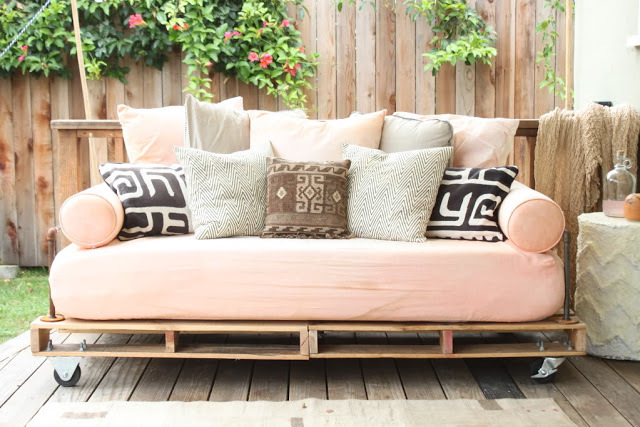 If you are looking for unconventional outdoor furniture, this pallet couch with galvanized pipe frame is going to catch your eye. The builder advises that you choose the pallets well because there will be visible parts and that you buy a thick mattress for the sofa. 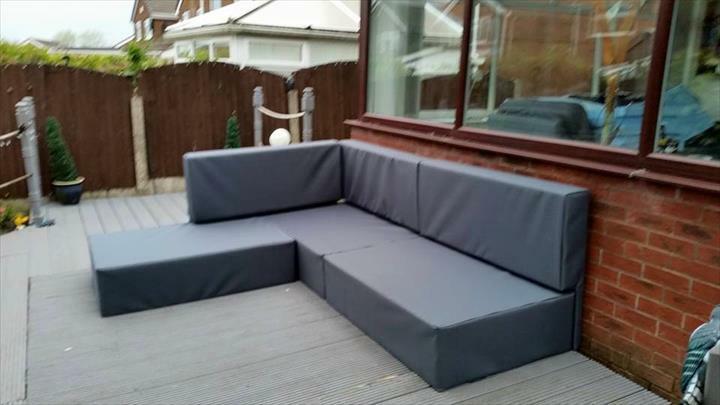 You can also add castor wheels for style and cover the sofa bed with water-proofed fabric if you’re going to place it outside permanently. This sofa bed is slightly more complicated to build than the previous pallet project. 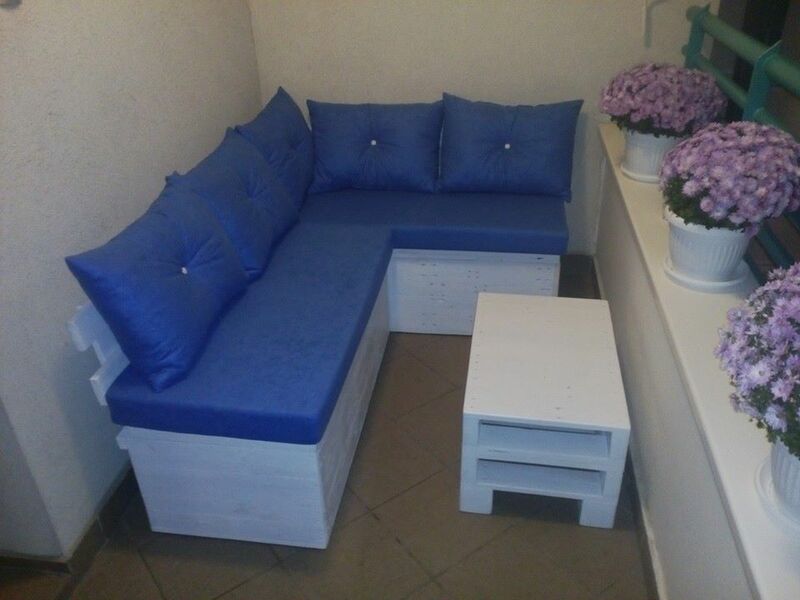 But the good thing for those with little experience is that there is a small sofa chair version, which you can make in two hours with two full pallets. For the large sofa couch, the builder recommends that you find a deep mattress that you like and that you build your sofa bed based on the size of this mattress. 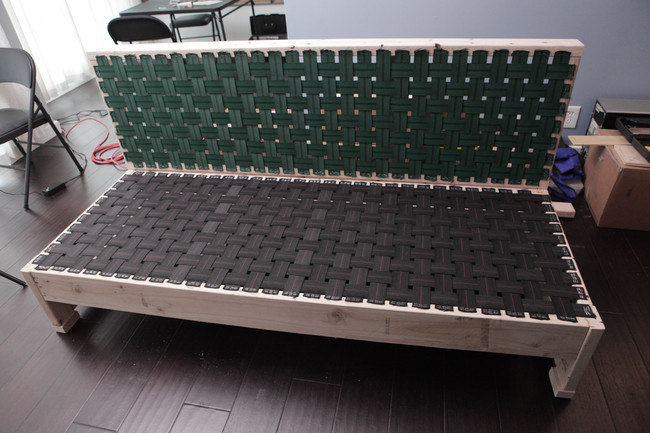 To make this cheap DIY couch, you need woodworking and sewing experience and some inexpensive foam cushions. Be careful when you take measurements for the cushions, or they won’t fit the sofa’s frame. However, the building instructions are on the thin side, and you’ll have to rely on your intuition and creativity. Do you love to build new things from old pallets? Then this couch bed plan is just for you. 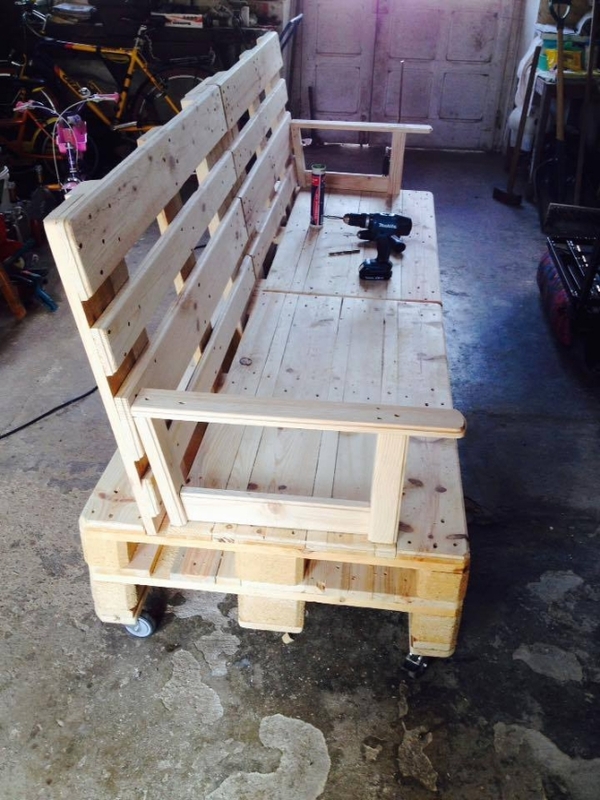 It’s made from raw pallet planks, and it has armrests and wheels for mobility. No more calling your friends to drag the sofa to the other room. What’s more, this sofa is larger than most cheap couches for sale, and its unique look is bound to impress your guests. A time comes when the children grow up, and you don’t need the old crib anymore. Should you just throw it out to make space for something new? No. 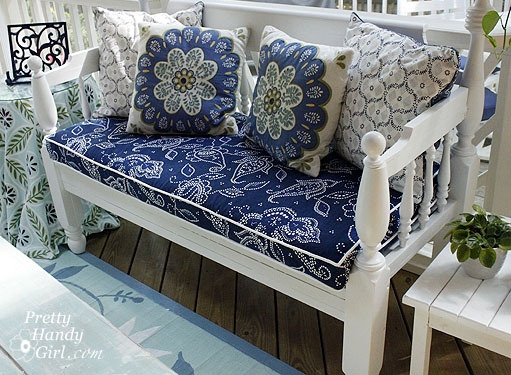 Instead, find two more old cribs and fashion them into a loveseat couch. 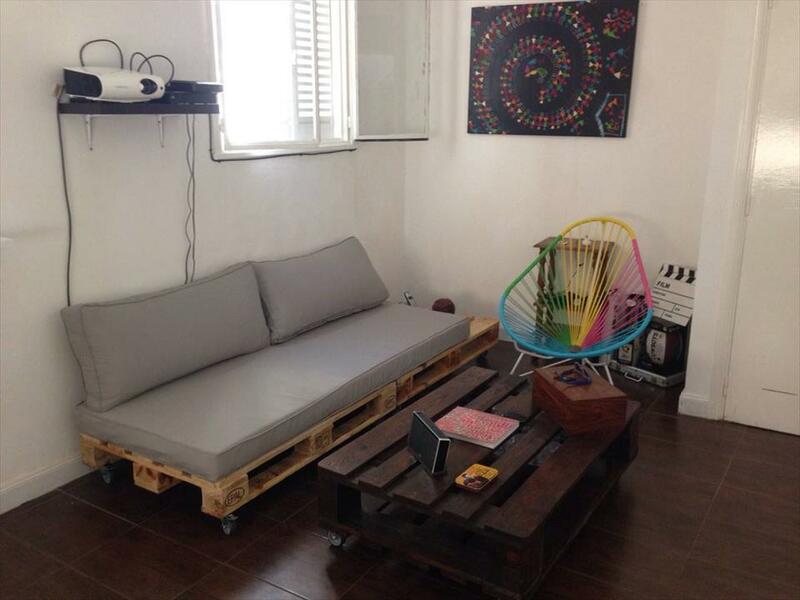 You already know that you can make a couch out of pallets, and you might think that nothing can surprise you. 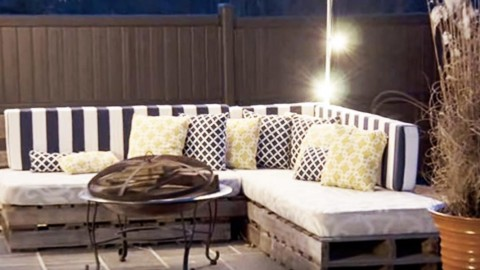 Then you must see this design that will show you how to make an outdoor daybed from pallets. The bed is big enough so that you can sleep comfortably on it, and it looks so cute you can hardly resist it. 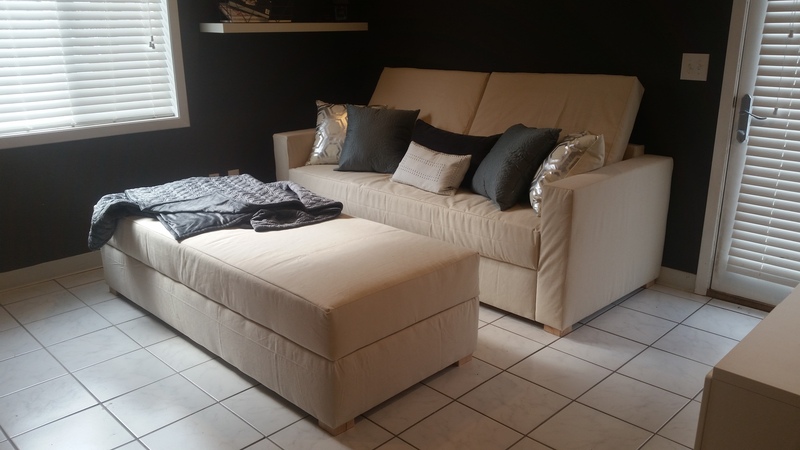 Do you want a movable sectional couch for your bedroom? It’s your lucky day. 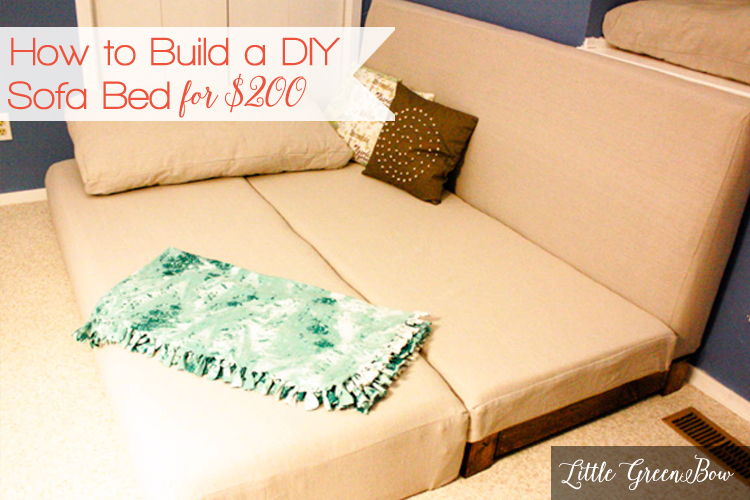 This plan will help you build an amazing convertible sofa, which you can use as a guest bed. 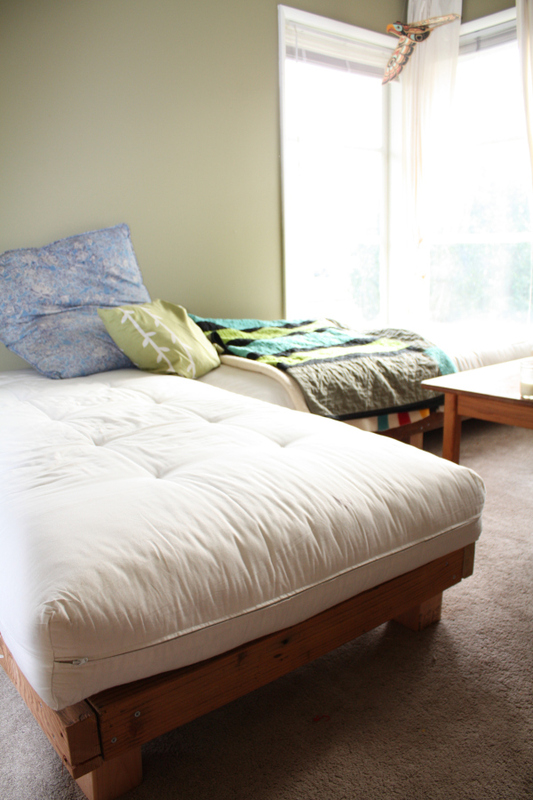 Just get two twin-size futon mattresses and some wood, and you’re ready to start. Keep in mind that this is a large sofa bed so make sure that you have enough space. If you are looking for a unique couch to impress your friends, this design will certainly catch your eye. The sofa here is made out of copper pipes and fabrics. However, there are no instructions on how to build it, just pictures of the building process and the necessary tools. Planning to buy some new furniture, for your new home? Then, why not buy a couch instead of that traditional sofa for your TV lounge? You might be wondering why you have not heard about couches before? No need to worry, read the whole article and you will learn a lot of information regarding couches in the end. A couch is a three seated sofa, in the form of bench, with or without armrests or back, shaped with springs and stylish cushions. Besides sitting, you can enjoy a good sleep over it. You can place couches in the family room, living room and lounge or even in your study room. Couches are in fashion now and can be found in hotels, bars or the waiting rooms. The word ‘couch’ originated from an old French word “couche” which means to “to lie down”. 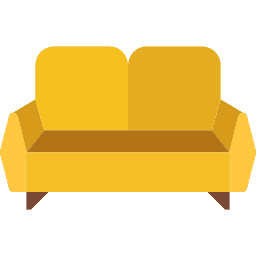 This term is mostly used in Australia, Ireland, North America and Ireland where native speakers of the United Kingdom generally refer this as a sofa or a settee. A sofa is basically a Turkish word originated from an Arabic appellation “Suffa” which means wool, deriving in the Aramaic word “Sippa” meaning mat.Settee comes from an old English word “setl” that was particularly used for long benches with arms and a high backs, but now this term refers to an upholstered seating. Chesterfield, divan, lounge, davenport are some of the words used to describe the same furniture good. The legs of this couch or sofa is curved outward and down, it came popular in the first half of the 18th century. Typically known as a Chippendale furniture during that era. This type of couch was named after its style as a term “chaise lounge” meaning long chair. It’s long enough to support the legs while you lean against the back of the sofa. Getting afraid that your house guests might ask you to give some extra sleeping space? 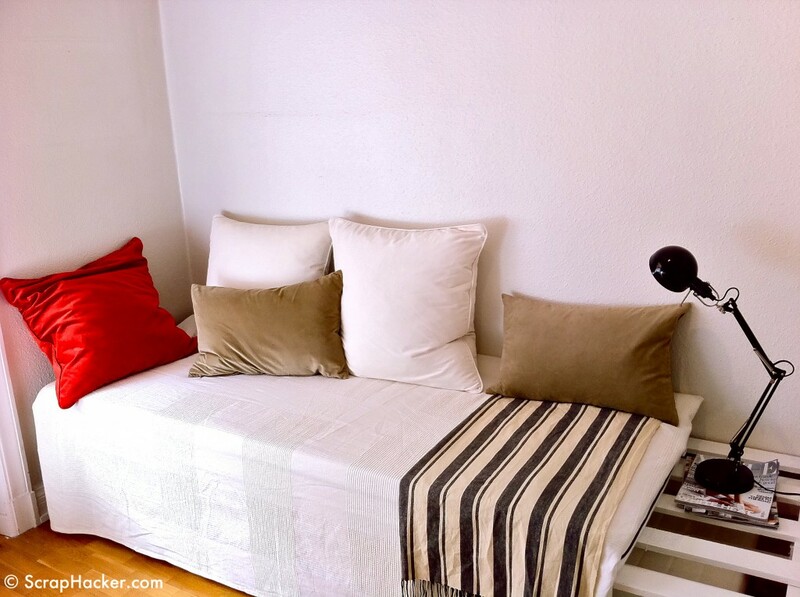 Don’t worry, according to the Home Dweller, keeping a daybed at home, which can be used as a couch by day and bed by night, is a smart strategy to accommodate house guests. This couch with rounded arms and loose cushions provides you with a super comfy choice. The cushions are not removable, making the back of the seat typically tight. The contemporary shape of this sofa is the best classical example of Hoffman’s geometrical lines and the quadratic theme of his work. 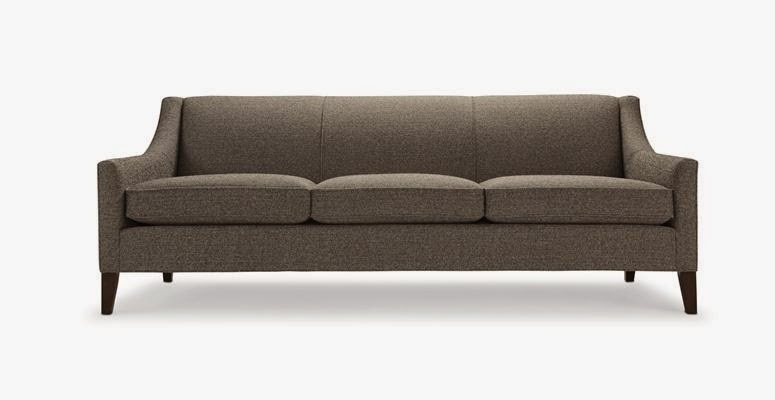 This sofa was firstly designed in 1980.the arms and back of this couch are of the same height. This arms of this couch are rolled outwards with the same height as the back. This leathery sofa gives you a great comfort so you will probably find in your home library. The couch fabric is the most visible evidence of quality and style. So, during your visit to the furniture showroom, make sure to choose upholstery with some points in your mind such as its durability, reliability, cleanability and it’s resistance to soil and fading. Couch fabrics are separated into different types such as natural fibers, synthetics, and DIY upholstery. Linen: Best suitable for formal living rooms because it catches dust and wrinkles easily. It must be professionally cleaned to avoid shrinkage. Cotton: It has a quality of good resistance to fading and pilling. Durability totally depends on the weave or finish. Sail cloth and canvas cotton is more durable and casual. Wool: Durable wools offers good resistance to pilling, wrinkling, fading or soil. Wool when blended with some synthetic fiber makes it easy to clean. Leather: A tough material that need to be gently vacuumed, dammed wiped or cleaned with saddle soap. Acrylic: Developed as imitation wool, which is able to resist wear, wrinkling, fading or soiling. Nylon: Nylon does not readily soils or wrinkles, but this fabric fades too quickly. So try avoiding the use of dark color nylon cover for your couches. Polyester: It is often blended with other fibers such as wool, to increase the wrinkles resistance, and reduce fading. Rayon: Rayon is best known for its durability, sill it wrinkles too quickly. Known as the best fabric for formal living rooms. Most home owners choose to arrange the larger furniture pieces first when making new furniture arrangements in their home. So, while situating a new space for your couch make sure to set a good pace while allowing everyone to easily walk through the space and that certain positions are in balance with the other pieces of furniture in the room.